PKR Vice President and Lembah Pantai MP Nurul Izzah Anwar lied to Jakarta based media Kompass on 5 August 2010 stating that the Royal Malaysian Navy submarines are defective and unable to dive. So are streams of Opposition Leaders in their intense daily campaign since July 2010 till present. Last week, again it was proven them wrong and they lied. 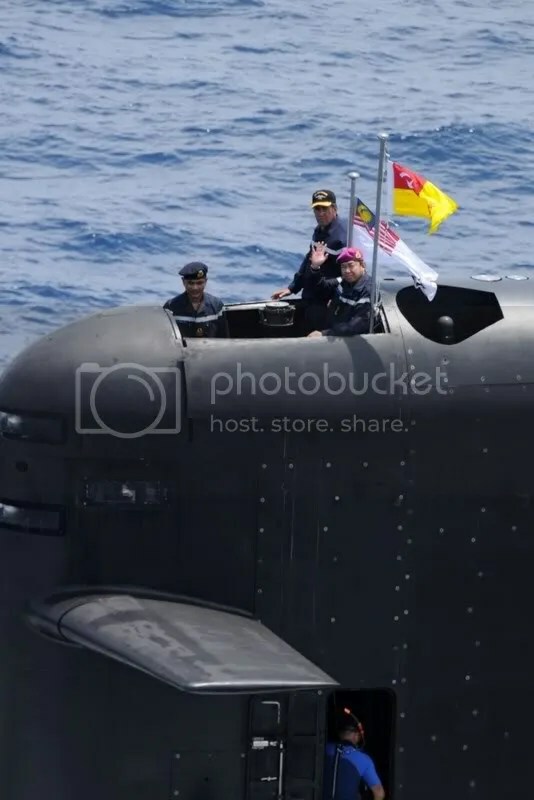 HRH Sultan of Selangor Tuanku Sultan Sharafuddin Idris Shah Ibni Al Marhum Sultan Salahuddin Abdul Aziz Shah who is also the Honorary Captain-in-charge of the RMN was onboard Scorpene Perdana Class submarine KD Tun Razak off the coast of Sabah for a military exercise. 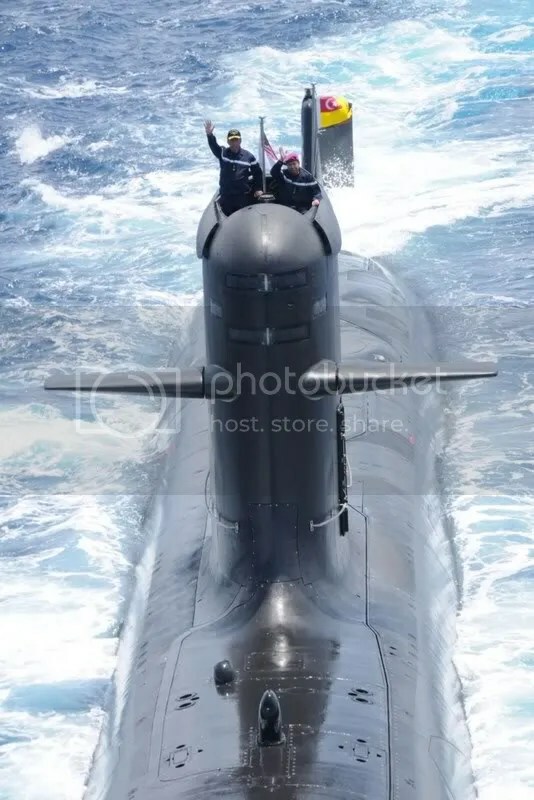 Not only HRH dived again with the submarine (second time since the boat arrived from the Mediterranean July 2010), he also witness missiles fired and hitting the target. KD Lekir fired an MM40 Exocet anti ship missile and Frigate F 30 KD Lekiu fired an anti aircraft missile Seawolf and hit the towed target. We have not seen the Opposition apologize and retract their continuous baseless accusations against the Armed Forces, particularly the Royal Malaysian Navy. In the strategy of ‘Politics of Hatred’ via ‘Politics of Deception’, they are systematically painting the picture that the Government is overspending for the defense of realm but because of blatant corruption, the nation has been shortchanged for defective and inferior assets and products forced down their throats. Recently, PJ Utara MP Tony Pua was shamed with his shallow analysis of the RMN’s intention of acquiring the LCS. This and previous military exercises proven them wrong and continuously to be wrong. They are wronged by their own sinister agenda. The RMN is diligent in their duty to make sure their assets are on high operational status and continuously conduct and participate in various exercises, which include naval forces from friendly nations. The fact is that, the Opposition did nothing for the defense of the realm. They never encouraged young Malaysians to join the service and never praise any of the service for anything good they did, even in combating pirates in the Arab Sea and Sulu Sea. Then again, the irresponsible Opposition Leaders still keep harping on the same drama with a slight tinge of presentation to justify their blatant lies manipulated in different forms and angles. All is pointing towards them as being unbecoming of elected representatives and Parliamentarians. They should be reprimanded. 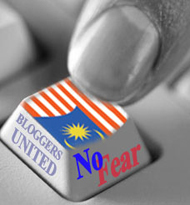 They are shortchanging the rakyat who gave them the mandate. The Rakyat can decide at the pool who to be next in office. Anyways, to budget another RM 500M (wow!) for maintenance sure raise a lot of consternation. doesn’t it? at the pool? you mean at the poll? Consternation not because of the budget – which has explanations and justifications for the amount – but because of the questioning without any justification or explanation. Too bad we are in a situation where no proof, no matter how solid and tangible it maybe, will be accepted by the irrational mind of the opposition. They are hell bent on accusing the RMN’s submarine cannot dive. Also it is ‘second hand’ and useless in defending the interest of this country. One good example is an idiot above who call himself Malaysian. First it doesnt cost RM500 mil per year to maintain the submarines. Then implying that submarine “cannot defend our fisherman ships, let alone shooting Singaporean aircraft” is somehow a role that is supposedly assign to a submarine. Since when did a submarine employed to shoot down an aircraft?? This is exactly the kind of hopeless mentality we are dealing with. An ignorant beyond salvation. Yet it is prevalent among those who opposed anything and everthing that the government do to strengthen the armed forces. Perhaps we’ve been lull by the extended peace that we assumed we are entitled with. One that many think came naturally at no cost. Suddenly people like Tony Pua and Kua Kia Soong became the new Clausewitz or Sun Tzu. All the experience and expertise gained throughout the establishment of the respective branch of the Malaysian Armed Forces and the vast amount of collective, professional knowledge gain from study in the art of war by the armed forces Admirals, Generals and Air Marshall meant nothing. Oh what the heck, while we are at it, I might as well leave you guys with another one. no matter how solid and tangible it maybe, will NOT be accepted by the irrational mind of the opposition. By the way, as far as these 2 clown of a defense expert (Tony Pua and Kua Kia Soong) writings and claims goes, they have been thoroughly debunked and discredited by a proper and renown defense analyst inside and outside of Malaysia. The book that Kua Kia Soong wrote even contained a made-up quote to support his case. It is only befitting his reputation that his ‘book’ was launched in some obsecured eateries. But then again what do you expect from a politician with a grudge like Tony Pua who cant even tell the differences between a simple Patrol Vessel (PV) and a Guided Missiles Frigates with additional specialized capability to undertake maritime warfare operation as well as other mission to support operation ashore from within the shallow areas near the coast (known as the Littorals in naval parlance), hence the term Littoral Combat Ship (LCS). Unfortunately for Malaysia, YB Tony Pua has a large following that laps up every slob and spit that he intermittently spews in between his mocking lips. This man feet has grownn too large for his shoes. I believe that he may be at the stage where he actually believes what he says. So will all his dopey-eyed believers. Notwithstanding his citizenry, this mas has become the fifth column for Malaysia. I might add that it’s regrettable that we spend half a billion ringgit at least to defend the populace that includes Mr. Malaysian. Its not possible to exclude Mr. Malaysian from the penumbra of national defense, should one day we were to be attacked by a hostile nation(s), is it? He and the punk fella would have absconded before the attack. What does Nurul Izzah know about defence and submarines anyway. She belongs to that family of liars, doesn’t she? The father asked for the hand to be bandaged and the neck be hard collared and the doctor mother certified those needed be done, then had them photographed, trying to show so-called Police brutalities during the Bersih Rally. Only to be made fools of when the Police rally footage was aired on TV. And what can people credit Tony Pua and Kua Ka Soong for, except lies, deceits and DAP propaganda. Isn’t Ka Soong the fellow who wrote a book denying DAP’s involvement in the 1969 race riots and about defence spending in a book whose sale was launched in an Edgware Road restaurant in London? See, not even a book store was willing to allow him launch his book sale in its premises. They know what kind of a fellow he is, writing completely nonsense and contrary to what has been written about the race riots all these 40 years. He knew Malaysians know what kind of writing he did and didn’t dare launch his defence book sale in this country. But to launch it in an Edgware Road restaurant … pathetic. Perception Management involves falsehood and deception; and the purpose is to get their audience to believe what one wishes them to believe, whatever the truth may be. The Reply mode does not appear to be working. But I think readers generally get the message of where my comment(s) should be placed, especially after my above explanation. Sorry for my name appearing to be crowding the place, folks.